The late Dr Milton Erickson, one of the fore-fathers of modern hypnotherapy, often incorporated metaphors into his sessions as he believed that the unconscious mind would make sense of the meanings behind these and apply them to his client's issues. This is a very short metaphor that describes how destructive anger can be (but without actually pointing this out to a client). 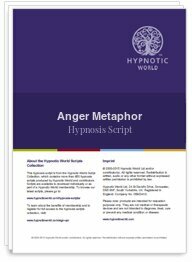 Although the metaphor is intended to address anger issues, with a little imagination and adaptation it could easily be applied for other issues in order to help your clients.